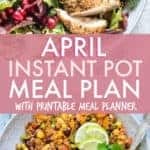 Plan your April menu with this April Instant Pot Meal Plan. 4 weeks of mains plus 4 breakfasts, 4 sides, and 4 desserts are included. Follow along as listed or mix and match to create the perfect meal plan for your family. 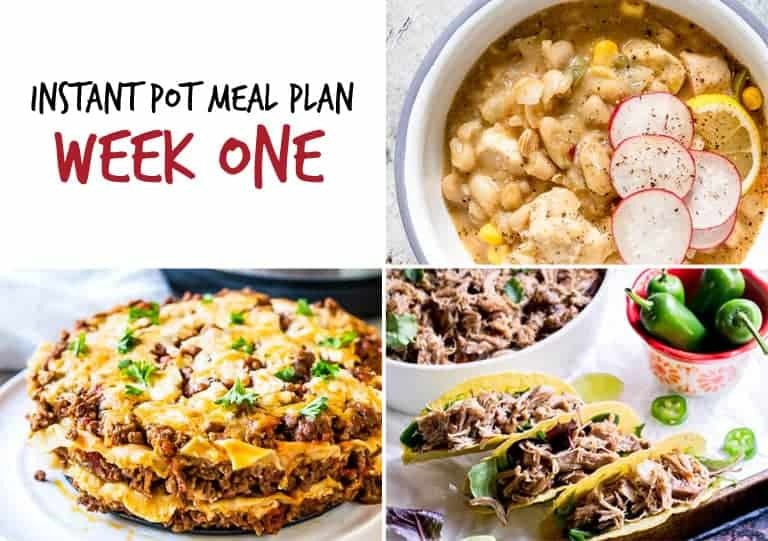 This Instant Pot meal plan is designed to make your life EASY. No more worrying about what to make… I have got you covered. We all know meal planning can make life easier, but what are some of the specific benefits of meal planning? Meal planning = best thing ever. All of my free printables are housed together in my subscriber library. 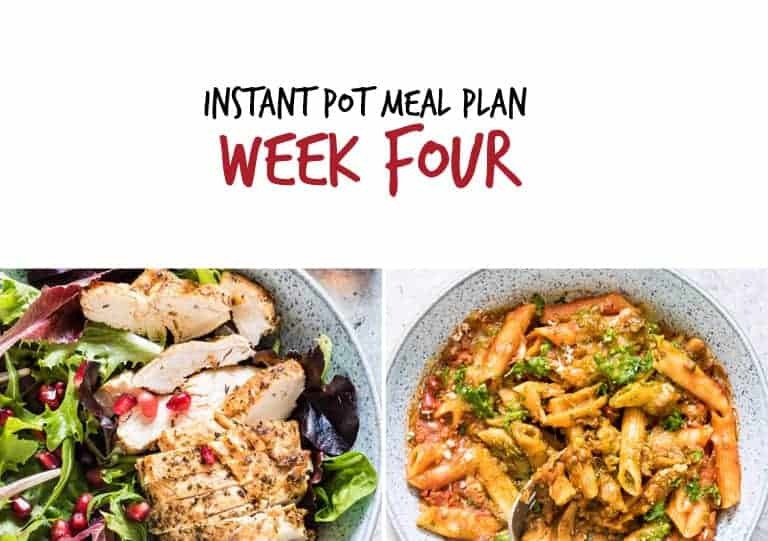 To gain instant access and to get your free Instant Pot meal plan printables, click below to sign up for my newsletter and receive your password. Note: no need to complete this form again if you are already a subscriber. You’ll find a link to the library and your password at the bottom of every email update, so you’ll always have access to the library. I have included 4 full weeks of main meals (28 meals). You can follow the meals in the order they are listed, or feel free to swap them around and make this meal plan your own! 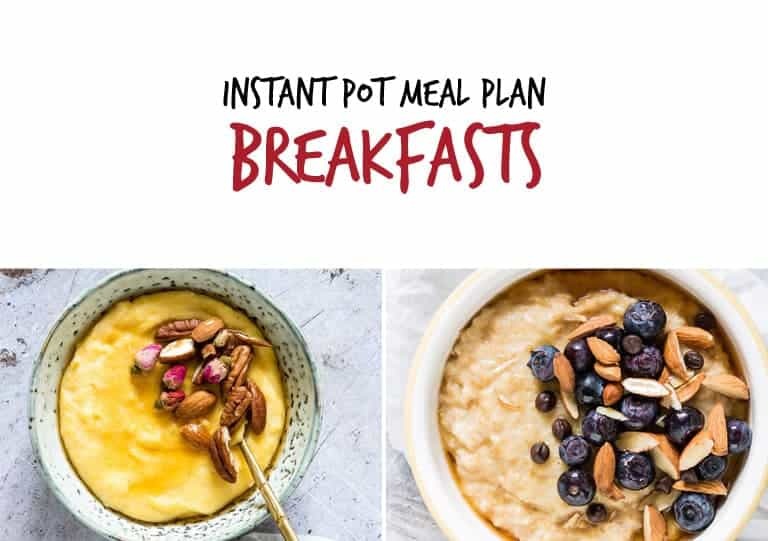 Pick from the selection of breakfasts, sides and desserts to build out your menu each night or use non-Instant Pot foods and drinks to complement your main dish. 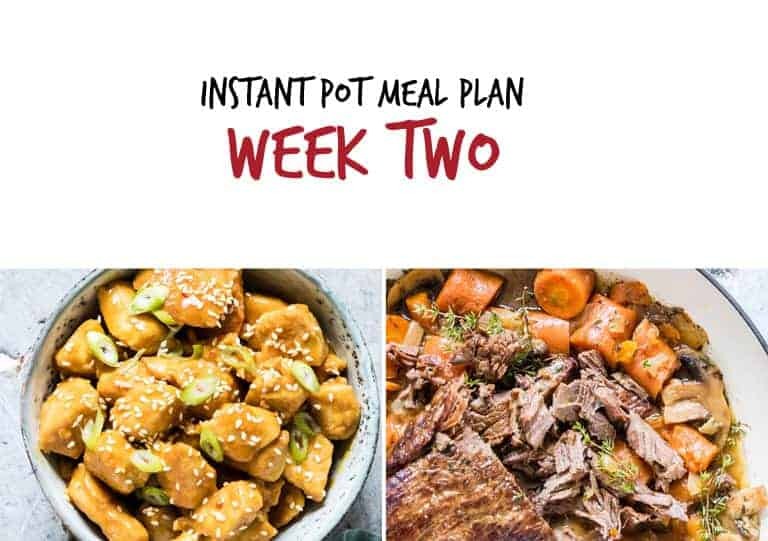 This Instant Pot meal plan is meant to be easy peasey, so do what makes your life easiest. I have also included dietary trends (e.g., gluten-free, vegan) for easy reference if you need to be mindful of them for family members. Before we get to the meal plan, let’s talk about a few pantry staple essentials for easy and efficient Instant Pot meal planning. Stocking up on these essentials will make your supermarket shopping easier. Here are some of the items you will need to help meal planning. Use please this to check the internal temperature of meat. Don’t forget to bookmark this page so you can access all future meal plans. 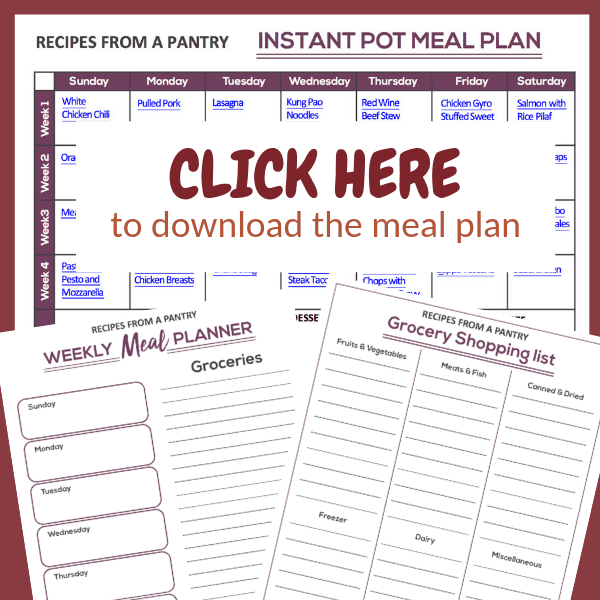 To get your free Instant Pot meal plan printables, click below to sign up for my newsletter and receive your passcode to the free printables library. Week 1 begins with flavourful white chicken chili, super tender pulled pork, quick and easy lasagna and delicious King Pao noodles. Finish up the week with satisfying dishes like hearty red wine beef stew, chicken gyro stuffed sweet potatoes and salmon with rice pilaf. It’s all about variety this week! Starting off with delectable orange chicken, tender pot roast and a spicy cajun pasta. Week 2 also includes creamy broccoli cheddar soup, steamed vegetable dumplings, a classic tuna noodle casserole and healthy vegan burrito wraps. 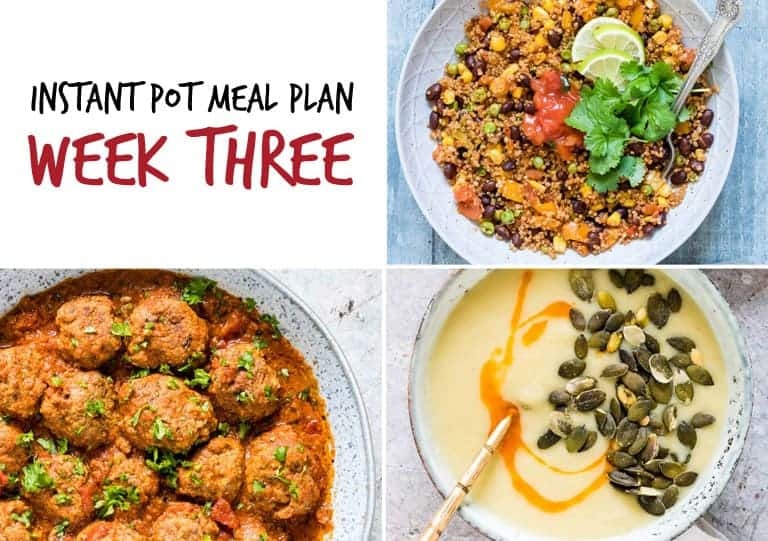 In week 3, you will enjoy divers offerings like low-carb meatballs, zesty Mexican Quinoa, smooth and satisfying potato soup, flavourful shrimp paella, fettuccine alfredo pasta, pork carnitas and tasty potato adobo vegan tamales. Week 4 includes everything from comforting pasta with pesto and mozzarella, the very best (really!) 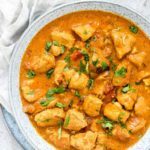 Instant Pot chicken breast recipe, flavourful Chana Saag and 10-minute steak tacos to pork chops with bacon and gravy, classic Zuppa Toscana and a delicious German sauerbraten recipe. Break out of your boring old breakfast rut with these fabulously flavourful and easy to make dishes. From hearty steel cut oats and polenta breakfast porridge to savoury tomato basil eggs en cocotte and sweet French toast casserole, your morning meal will be a lot more interesting. From Mexican rice and scarlett farro salad to mashed cauliflower, these side dishes are easy to make, full of flavour and super versatile. And with this recipe for making Instant Pot Iced Tea, you have 3 refreshing ways to quench your thirst. 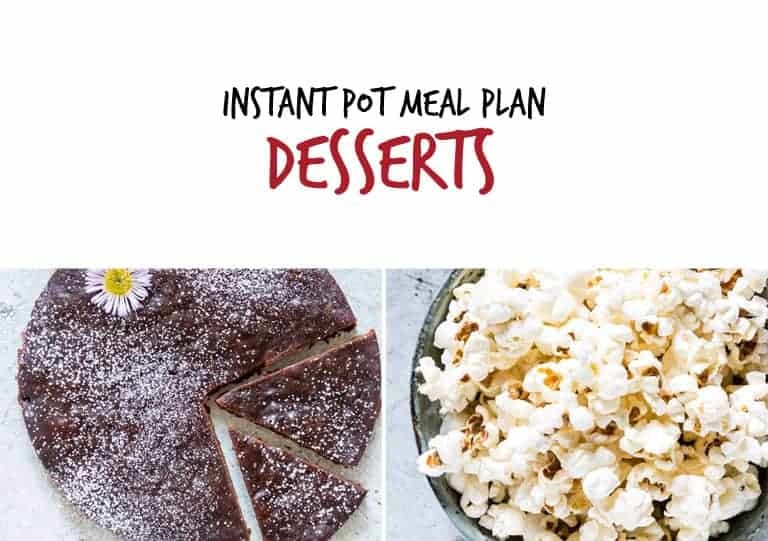 From salty to sweet and everything in between, there is an Insert Pot dessert recipe to suit everyone’s taste. Including rich and chewy brownies, crunchy popcorn, creamy lemon cheesecake and a flavourful Irish Car Bomb Chocoflan, you’ll want to make these delectable treats again and again. 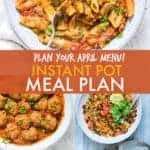 I will be updating this post with more Instant Pot meal plans, so please bookmark this page and check back often. Thank you for reading my Instant Pot Meal Plan post. And please come visit again as I continue dreaming up recipes, traditional African recipes, African fusion recipes, Sierra Leone recipes, travel plans and much more for you. Thanks for supporting Recipes from a Pantry, UK food blog. These all look fabulous! We had an old fashioned pressure cooker that goes on the stove for years and I didn’t really use it as it was a faff. We just bought a modern one and I’ve really been enjoying experimenting and finding new things to make. I’m definitely going to be trying out some of these recipes! 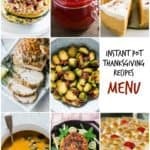 So many great recipes to try! Definitely will be pinning this to try all of them! Wow, how many recipes. Everyone looks delicious! This is a great idea every day. Pinned for later! This is so awesome!! i also love to plan, so stuff like this is always fun for me 🙂 Plus, I love the instant pot!! Wow this is a great meal plan and an amazing collection of recipes. You just made my life so much easier! Thanks for including my recipes. So many great recipes!! Thanks for sharing!! This is so helpful! The recipes all look delicious and I am loving the printables. Pinning! 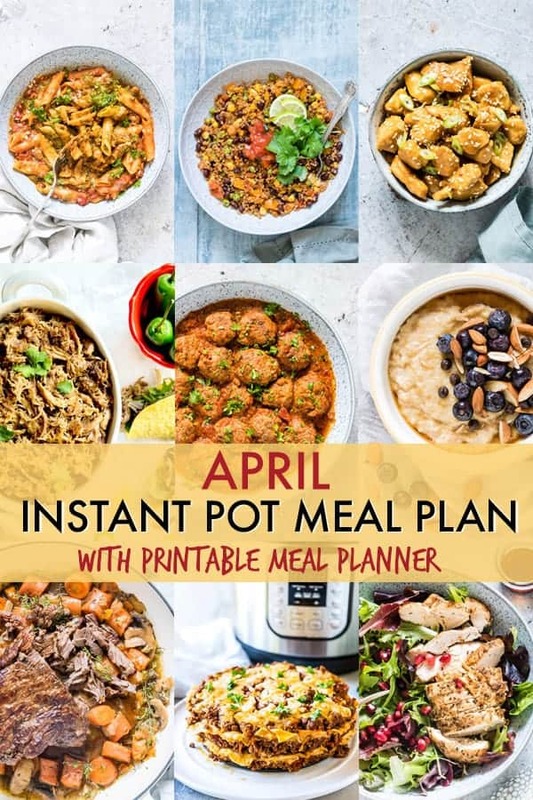 I don’t have an Instant Pot but I definitely need help in the meal planning department! These ideas are great! Yes, you are totally normal for planning Christmas presents in June! The Turkey Breast with garlic butter gravy is calling my name. This list is fantastic, so organised and many options with variety with meals. 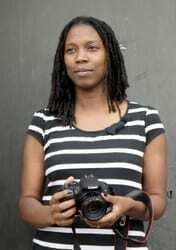 Cheers for sharing Bintu. All the recipes look great ! Such a fabulous Meal plan for December.It is well balanced and nutritious as well. Thank you for including some of my recipes as well. After all of the craziness of the holidays, this is such a great way to take the stress out of figuring out meals. Thank you! SO many great recipes here! I love the idea of doing meals plans, it sure would make life easier. Plus, I am a huge fan of instant pot cooking! WOW! This is amazing and makes eating healthier so much easier. 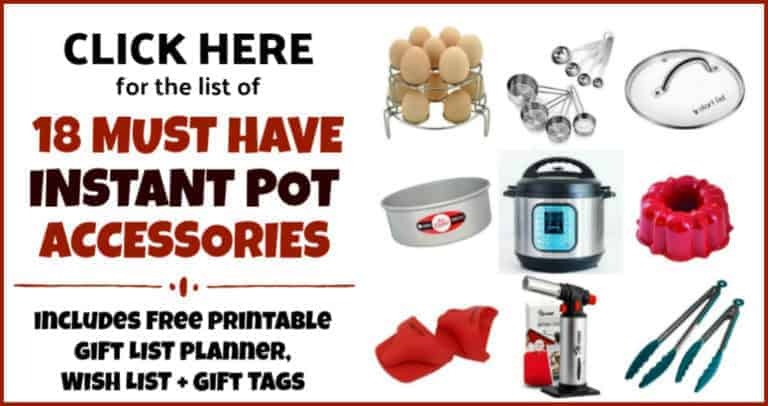 This is a great resource for anyone who has an instant pot. 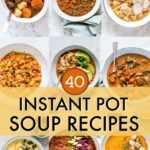 Sooooo many great recipes to make in my new Instant Pot! I can’t wait to try them all! I am just loving your meal plans so much! the instant pot is my favorite thing to cook with, and this makes it so easy to plan out some meals. Meal planning makes life easier. 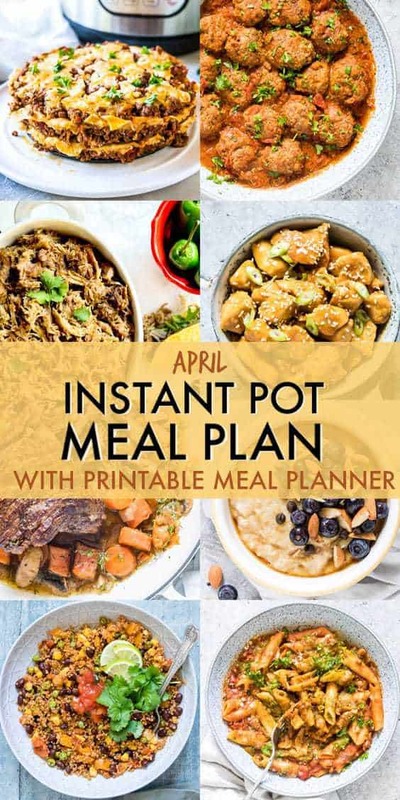 What a great idea to make meal plans around the Instant Pot! I use mine all the time and can’t wait to try some of these! You did it again! This is such a great way of keeping on track with your eating and budget. I really like how you have all types of meats so no one gets tired of one thing! These are wonderful ideas and a great collection of recipes too. Thanks for sharing! This is such an amazing guide. 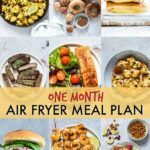 I always love your monthly IP meal plans, so many great options! I really want to try that African pepper soup! this is so helpful and so many great recipes your family is so lucky to have such an amazing cook! This is such an awesome roundup! I can’t wait to try so many of these recipes! I have an instant pot, but haven’t used it much. You’ve inspired me to get it out try some of these recipes! So many fantastic meal ideas!! I am a planner, also, so I totally get it! 🙂 Thanks for including my wild rice soup, also! Yum! So many recipes! You really did a great job, Bintu! how do I print out theme plan? I am already a subscriber – I have the password, I’m just not seeing the link to clink on for the full printable meal plan. I can’t wait to give some of these recipes a try! what a great idea! 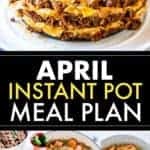 I love my instant pot and this is so convenient to have! Going to have to print that free list thanks! So many great options! Your recipes always look so beautiful and delicious! OK this made me even more sure that I have to get an instant pot asap!! Just waiting for the craze (and the pots…) to come to Sweden – maybe I’ll have to start it?! Wow! So many great IP recipes!! !